This online resource was designed to provide you information for Notre Dame Cathedral in Paris, France. 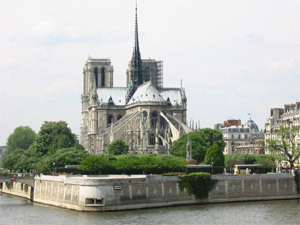 Notre-Dame dominates the Seine River and the Ile-de-la-Cité (small island) as well as the history of Paris. On the spot where this majestic cathedral now stands, the Romans had built a temple to Jupiter, which was followed by a Christian basilica and then a Romanesque church. Maurice de Sully, bishop of Paris, decided to build a new cathedral for the expanding population, dedicated to the Virgin Mary. Although construction started in 1163, it was not completed until roughly 180 years later in about 1345. Built in an age of illiteracy, the cathedral retells the stories of the Bible in its portals, paintings, and stained glass. Notre Dame has had an eventful history over the centuries. Crusaders prayed here before leaving on their holy wars, and polyphonic music developed in the cathedral. Notre-Dame was pillaged during the French revolution, as were a number of other cathedrals throughout France Many of the cathedral's other treasures were either destroyed or plundered — only the great bells avoided being melted down. Revolutionaries dedicated the cathedral first to the cult of Reason, and then to the cult of the Supreme being. The church interior was used as a warehouse for the storage of food. During the 19th century, writer Victor Hugo and artists such as Ingres called attention to the dangerous state of disrepair into which the Cathedral had fallen, thus raising a new awareness of its artistic value. Whereas 18th-century neoclassicists had virtually ignored the creations of the Middle Ages — and had even replaced the stained glass at Notre-Dame with normal glass — the 19th-century romantics saw that remote period with new eyes and greater appreciation. In his restoration of the cathedral (begun in 1844 and lasting 23 years), Eugène Emmanuel Viollet-le-Duc reinstated the triforium and small clerestory windows in the eastern bay of the nave. The sculpture on the west facade, badly damaged during the French Revolution, was also restored during this period. Yet it is the art of Notre-Dame, rather than its history, that still awes. The west front contains 28 statues representing the monarchs of Judea and Israel. The three portals depict, from left to right, the Last Judgment; the Madonna and Child; St. Anne, the Virgin's mother; and Mary's youth until the birth of Jesus. The interior, with its slender, graceful columns, is impressive — there is room for as many as 6,000 worshipers. The three rose windows — to the west, north, and south — are masterful, their colors a glory to behold on a sunny day. 1239 The Crown of Thorns placed in the Cathedral by St. Louis during the construction of Sainte-Chapelle. 1302 Philip the Fair opens the first States General. 1430 Henri VI of England is crowned. Mary Stuart becomes Queen of France after her marriage to François II, and is crowned. 1572 Marguerite de Valois is married to the Huguenot Henri de Navarre. December 2, 1804 After the anointing by Pius VII, Napoléon seizes the crown from the pontiff and crowns first himself, then Josephine. August 26, 1944 The Te Deum Mass celebrates the liberation of Paris. November 12, 1970 The Requiem Mass of General de Gaulle is held. May 31, 1980 After the Magnificat of this day, Pope John Paul II celebrates Mass on the parvis in front of the Cathedral. Museum, Wed. and Sat.-Sun. 2:30 - 6 p.m.; Treasury, Mon.-Sat. 9:30 a.m. -5:30 p.m.